Srpuls.CZ | VINYL DISK MUSICK [Rozhovory] PULS "We are still rockers!" >>> I n t e r v i e w s >>> PULS "We are still rockers!" PULS "We are still rockers!" 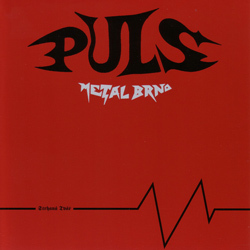 Most of the metal fans even did not noticed that some eigth years ago there was a short comeback of heavy metal band Puls. Maybe because it was too long since they had been on the top of their popularity, maybe because of this popularity was mostly of local importance only. But thanks to this comeback the band released a compilation of their greatest hits from the 80s period. This CD was also licenced by a Greek label. Aside from this CD the band left behind one 7" EP (find its review in our reviews section) and an interview done in 2001, which we now invite you to read. 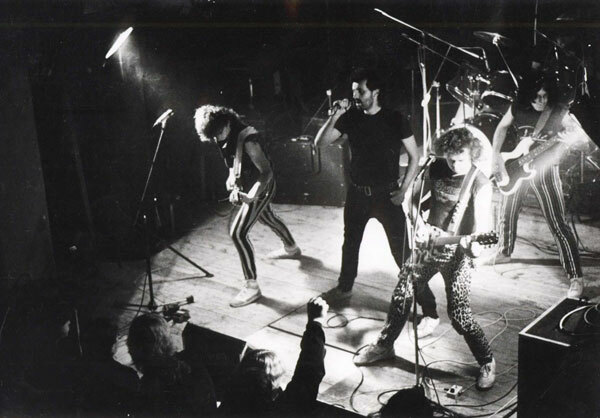 In the 80’s Czech Republic, there were a lot of heavy metal bands, which fell into oblivion. No matter if they play first rate metal or if they music was rather average. It means, that there were many bands, which will forever remain unknown and unappreciated. 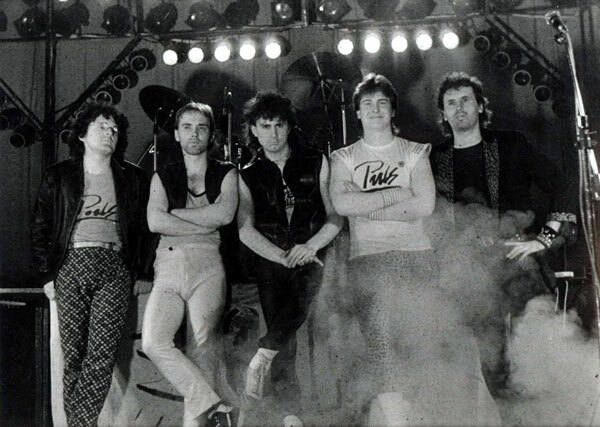 In 1999 Puls released a CD "Bigbít je v nás" with songs from the period 1985 - 1991 and when I found out that the band is alive again, I realized that they belong to the „first rate but unappreciated“ category. It is an very emotional to meet the band whose music you grew up with, whose music you know by heart. It was big honour for me to talk with Jiří Kubowský (vocal) and Jiří Zich (guitar) about Puls, and the heavy metal scene of the 80’s and how it all changed during a decade. How is it possible, that you have no official releases? At the end of 80’s a lot of bands released an LP, or at least a single. Such recordings made the bands quite popular and a little unforgettable, although their music is not always the best. Was it the period when you no longer played? Or there was no interest from any label? In fact, you remain only in the metal underground. JZ: I think it is because of we were never much cheeky, we were rather modest. 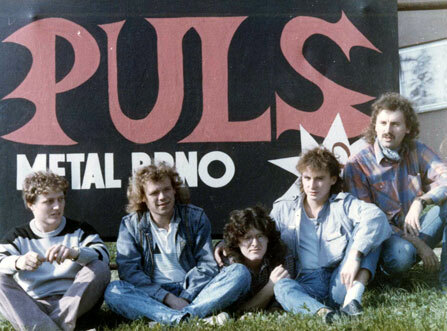 Puls came into being in 1984 and we didn’t fight for it. There were many bands, which came into being in the middle of the 80’s. And many of them were fortunate to make some records at the end of 80’s. JZ: Well, it is not so simple if you mean the political changes in 1989. In the communist regime, it was easier in some aspects, and difficult in other aspects. People craved metal, most of the teenagers were metal fans. After the changes, the interest in metal was not as strong. On the other hand, after it we could make some recordings in studio, we could get together money for it, so the conditions were much better. If I understand, you have recorded something? JZ: In fact, we had recorded a complete album. It was in 1990. But the album was never released. JK: It also depended on who came earlier. A band must be promoting themselves, they must have a good manager. Look at Titanic, they had such an manager who made the band. As well as Kern. So if someone at a label listened to our music, he must think that there is Titanic and Kern, and that is enough from Brno (notice: Brno is second biggest city in the Czech Republic, but all the important labels were from Prague). JK: Yes, I had two children, so it was because of family. JZ: The line up changed, and then, I don’t like to insult the guys, but there was no one, who would lead the band. So it was not released. JK: Yes, but in different line up. And they split six years ago. And we started again two years ago. We had a few concerts but not many. Otherwise, we would need a manager, and even if there is one, we are not as flexible as we all have to take care of own jobs. Nevertheless, we are still rockers. We need to make music moreover some fans still remember the 80’s. There are some live recordings, not only from the non-released album and fans know them. You know, people went to concerts with tape recorders. But the quality was not good. So we recorded some the old songs again and we put them into the CD with the album ones. JK: There is about 560 copies. And as we said, we had a few shows. The attendance was quite good, but we don’t have time to make publicity to the concerts. You know, if there are to be a lot of people at a concert, you would need money for advertising it, posters in advance etc. We don’t have this management. But if someone invites us, we are happy to accept it. This year we played with Tublatanka; it was a great evening. JZ: For example last year we played with Arakain. Can you compare it with the 80’s? What’s the major difference? What about fans? JZ: Certainly, there is a big difference. Realize, that ten years is quite a long period. I think that young people are not interested in hard music. JK: Metal moved to clubs, concerts with thousands people are deep in the past. At that time, no foreign bands played here. So if people wanted to se them, they must go to Hungary or to Poland. Today here, almost each week, there is some foreign band playing in Czech. At that time, you played pretty often, didn’t you? JK: Very often. At least two or three times a week. We played mostly here, in Moravia. JZ: Several times we played in Prague as well, for example in Lucerna. (notice: that was one of the two heavy metal tabernacles in Prague and in Czech Republic - it was a success for each band to play there) It was sometimes with Merlin, Vitacit etc. Generally, we played much more often in Moravia. We were never very popular in Bohemia. Did you often play at festivals? There were some at the time. JK: Yes, we did. For example here in Brno we played with TSA from Poland, Arakain was there as well. JZ: I don’t remember it all. We played often in Slovakia (notice: at the time it was one republic, Czechoslovakia) and so on. JK: And TSA, they were better than all our bands. It was great when they told us that we played well, that they like it. Do you know TSA? I’ve never seen them, but I know their records. JK: The show was so great, so convincing. I can’t believe it. In Prague, the scene was very extensive and it worked well. JZ: But in Prague, they had own bands. Only a few people were interested in bands from elsewhere. JK: We had to divide our time to music, family and job. Bands, which play currently, like Arakain for example, they decided to earn their living by music. Of course, it was difficult from the beginning. Some bands came short of their expectations, for example Arakain managed it very well, as you can see. Arakain today produces different music than in 80’s. They managed to obtain new fans. As for your concerts, do new fans come there, or do you think there are mostly the older fans, who come to remember Puls? JZ: I think the later is the case. To remember, to relive fond memories. Arakian has much easier task as for fans. First, they are from Prague, and second, their label pushes them into TV, radio, of course, mainly into magazines. They give a lot of money into these issues and they have appropriate outputs. But I have to say that it is a great band, great musicians. But for other bands, it is not enough. JK: I think that we have many great musicians, with great ideas. But not all can put themselves through. It was 1987 or so, there was a radio show called Větrník. Only radio show with metal music at the time. There was a chart or something like that and you won it three times, which was the maximum as each band could get on just three times. Even this success remained unnoticed? JK: We didn’t manage to take advantage of that. We were satisfied with that large amount of people, which come to our shows only. Now I think it was a mistake. Look at Titanic, they gave their full attention to music. Music must be the first priority, second priority and ultimately the third priority. Family, for example is fourth etc. If you want to be at the top, you have to give up all the rest. We enjoyed all our shows, and we maintained our families, I think that’s a success as well. Sure it is. Are you already thinking about the future, will you work on the next CD sometimes? JK: Ha ha. Yes, if some rich man remembered he loves Puls in the 80’s, perhaps he wouldn’t build two more swimming pools at his garden and he would gave some money to us to make a CD then maybe. But who knows what can happen. Look now at the interview. We met here thanks to that metal show on the radio, which was on the air some 12 years ago, or maybe even more. So anything can happen. To your question, we don’t concert very often, but mainly we don’t create. We thought that we would try to make five or ten new songs, but people want us to play the old stuff anyway. If I will do something at all, I am thinking to collect the old recordings and burn a CD with them, of course, the sound will be of lower quality. It would be just a few copies, for the most loyal fans. Thank you for the interview, it was nice to meet you. Note: The interview was done in Brno in 2001.